Spending any holiday away from home causes one to reflect upon all they take for granted back in life as we know it in the States. This past Easter was no exception as several events took place that will undoubtedly remain vivid memories locked in my mind for decades to come. In past posts, I've mentioned our catholic community here on FOB Salerno, the Queen of Peace Catholic Church. The priest here presiding over the entire brigade's area of operations is Father Joseph Hannon. Father Joe is quite a remarkable man, you can read more about him here in a recent story that the military featured him in. At 68 years old, I have to say his energy level is quite inspiring; which I'm guessing is closely correlated with his religious workout routine. Several weeks ago Father Joe announced to us that his one year tour here was coming to an end and that he had received orders to head back to the States. Originally the Army (in it's infinite wisdom) told Lt. Colonel Hannon to prepare to make his way back to his post at Ft. Leavenworth, Kansas on April 20th. Knowing that his replacement was likely at least a month away from deploying, leaving those of us here without a priest over Easter, Father Joe volunteered to extend his tour and ultimately convinced the budget hawks back in Washington that this extension was a "worthwhile, necessary expenditure". 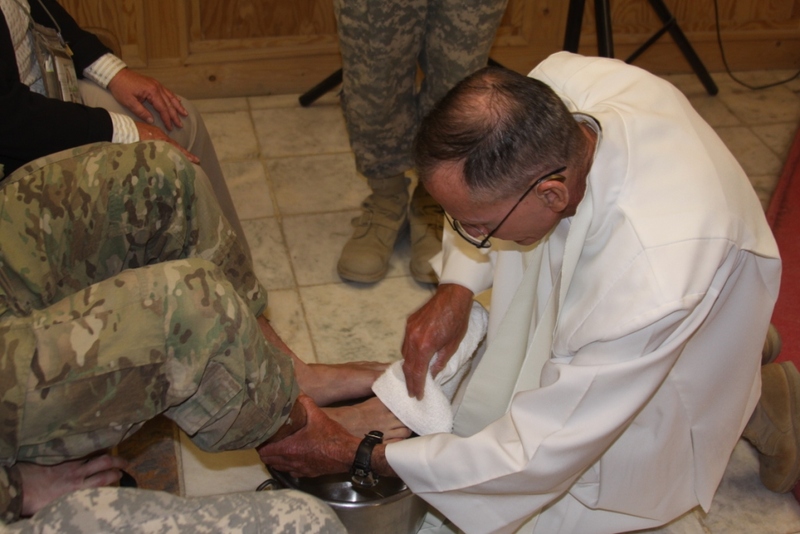 Holy Thursday, or Maundy Thursday as it is known by some, was the official start of our Holy Week activities here on FOB Salerno. Choir members and those involved in the lay ministry had been busy earlier in the week preparing for all of the additional mass parts that the Easter Triduum entails; but for the majority of folks around town Thursday evening is when the action got started. With the traditional washing of the feet and even a procession to a side chapel to store the Eucharist for adoration, you had to remind yourself often that you were in Afghanistan. Of course the arsenal of M-4 machine guns lining the aisles and 9mm handguns on the hip of each parishioner also served as a great reminder of our locale as well. 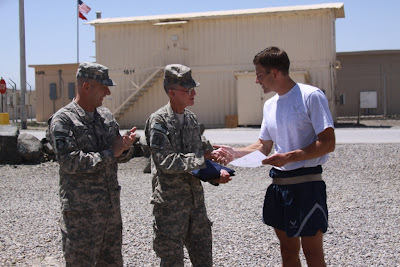 April 22, 2011 will be a day that those of us on the 3-19th ADT never forget. The fact that it was also Good Friday only compounds the magnitude of what so many around FOB Salerno saw and witnessed on this fateful day. For years now, FOB Salerno has carried the nickname Rocket City, a well-deserved title with the number of incoming rockets and artillery shells that find their way onto the base we call home. As the FOB sits in the Khowst Bowl, the surrounding mountains provide a breathtaking panoramic landscape; but also make ideal positions for enemy fighters to launch rockets from an elevated position right down into the base, sitting conveniently in the heart of the bowl. There are of course many defensive tactics employed to thwart these rockets, but unfortunately a few still manage to make their way onto the FOB. On Good Friday, the day billions around the world commemorate the crucifixion of Jesus Christ, the Lord called one of his own home from FOB Salerno. Captain Joshua McClimans, an emergency room nurse here at the Salerno Combat Support Hospital, lost his life as a result of indirect fire during an attack by insurgents. I still hesitate to post such grim news, in an effort to avoid unnecessary worry from so many of you devout supporters. However, as I think about the fundamental purpose I started writing in the first place- that of serving as a historical record to document my year here, I would be remiss in my duties if I failed to mention this gentlemen who made the ultimate sacrifice. The fact that he was an emergency room nurse, sent here to help others in the first place, only makes such a loss that much harder to swallow. Throughout the course of the last six months, Father Joe has been counseling three dedicated soldiers on the Right of Catholic Initiation for Adults. The program was designed in an effort to allow these three men the opportunity to join the Roman Catholic Church, with the culminating event held in conjunction with the Easter Vigil. As the Easter Vigil began, we all gathered around a small bonfire (although the FOB has a zero tolerance policy on flames after dark, I don't think anyone was going to stop Father Joe as he was on a mission) outside of the chapel where Father lit the Easter candle and then led a candle-light procession into the chapel. 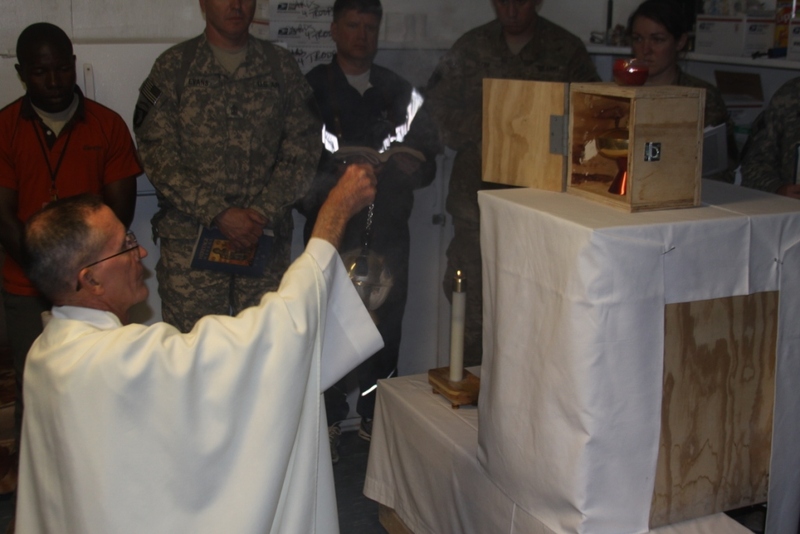 Captain Annette Podolak graced all with a breathtaking rendition of The Exsultet to begin the service, which was then followed by a traditional Easter Vigil mass. The three candidates began their entry into the church with the stating of their baptismal vows in front of the entire congregation. Anointing of all three men with the oils of confirmation took place immediately following the baptismal vows, and last but not least the trio was finally able to make their first communion with the rest of the parishioners. Easter Sunday brought another great crowd to mass, but it was the after-party that was really special. In a well-disguised, covert operation, several of us were able to lure Father Joe back to the 3-19th ADT compound where he thought he was just going to enjoy lunch in the rose garden. Upon arriving on the grounds, Father was delighted to see a few other parishioners already present with a large "thank-you" banner and even a few Easter treats. Having known that Father Joe was a native Hoosier, born in East Chicago, Indiana; we coordinated to have a State of Indiana flag flown over FOB Salerno on Easter Sunday in his name. Just after noon, our group moved over to the flag pole where his flag was flying and several of us made an official presentation of the colors to Father. In addition to his flag, Father Joe was delighted to hear that he had also received a letter from Lt. Governor Becky Skillman; thanking him for providing such a critical service to Hoosiers, Americans, and those around the globe. Yet once again, another week has passed and an additional set of memories has been archived. Some of these memories will last a lifetime, while others will be stored until the mind re-organizes them in an effort to prioritize, ultimately tossing out the non-essential details. While the Lord called one of his sons home on Good Friday, he also welcomed three new ones into his church over Easter. It happens ever so often, a grieving family is soothed by the birth of a new child. While all of these emotions can seem to push you to a tipping point, rest assured that all is under control. As I try to envision what memories I'll be able to recall in decades to come, there is little doubt that this past week will take up an extremely disproportionate chunk of space on my mental hard drive. Please keep the McClimans family in your prayers, as well as the families of all the troops that have given their lives over the last ten years of war here in Afghanistan- all in an effort to better the way of life for others. Rest assured that your continued prayers and support can be felt clear over here, 7,500 miles away. I loved your post. Fr. Joe is amazing! I was just looking him up because I am trying to figure out where he is now. He has touched so many lives. He reminds me of Fr. Kaupan. Wonderful post!